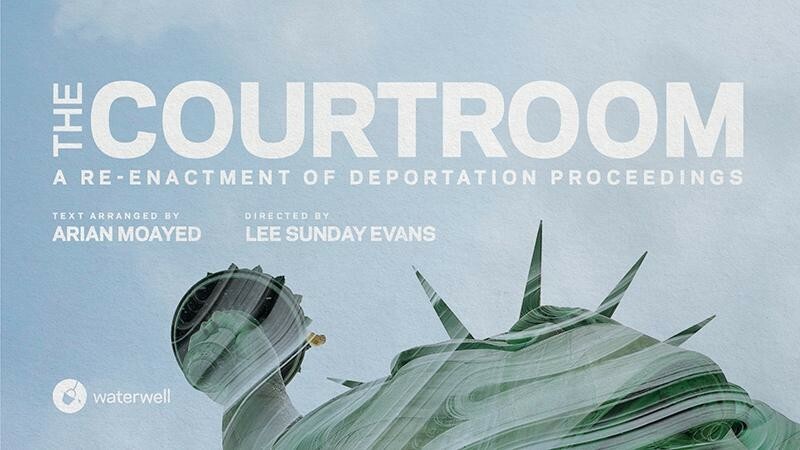 Join Micropolis host Arun Venugopal for a very special presentation of Waterwell‘s site-specific production of The Courtroom, a re-enactment of deportation proceedings. The performance features text arranged from real court transcripts by Waterwell co-founder and Tony Award nominee Arian Moayed, with direction by Waterwell Artistic Director and Obie Award winner Lee Sunday Evans. The cast will feature Tony Award nominee and four-time Obie Award winner Kathleen Chalfant, Happy Anderson, Tony Award winner Ruthie Ann Miles, Michael Braun, Hanna Cheek, Michael Bryan French, Mick Hilgers, Linda Powell and Kristin Villanueva. In 2004, an immigrant from the Philippines who was married to a U.S. citizen came to this country on a K-3 visa. After inadvertently registering to vote at the DMV in Chicago, receiving a voter registration card in the mail and voting, her removal proceedings were set in motion. It began in immigration court and her case was eventually heard by the U.S. Court of Appeals for the 7th Circuit. The Courtroom is performed verbatim from court transcripts. A conversation with cast and crew will follow the performance. → Watch a free live stream of the talkback at 8:30pm. Hosted by WNYC’s Arun Venugopal, Micropolis examines race, gender, ethnicity and urban life in America, in serious and not-so-serious ways. This season, Arun is back with one-of-a-kind conversations, live performances, and his true-to-form dedication to thoughtful perspectives and levity (because, this is quite a moment). See full series schedule, buy tickets or watch video of past shows.